Cognilytica tracks almost 3000 companies that offer AI-specific or AI-enhanced products for sale in the market. However, as you can imagine, there’s a great amount of diversity in these vendors. Some vendors focus on providing low-level “enabling” infrastructure that supports any range of AI, machine learning, or other compute- or data-intensive activity. Others provide a single-industry application that applies AI to a particular, specific business or industry problem. And of course, there’s a whole range in the middle. The main challenge that end users face is that they need to evaluate vendors in the context of the business problems they are trying to solve. These vendors are not at all the same, and in many cases, comparing them to each other is a frustrating activity of comparing apples and oranges. Some of the most widely circulated lists, or “classifications” of vendors are laughably terrible. They lump vendors together that don’t solve the same problems or have very little in common. Cognilytica looked closely at all 3000+ vendors in the market and classified them in a way that makes better sense. 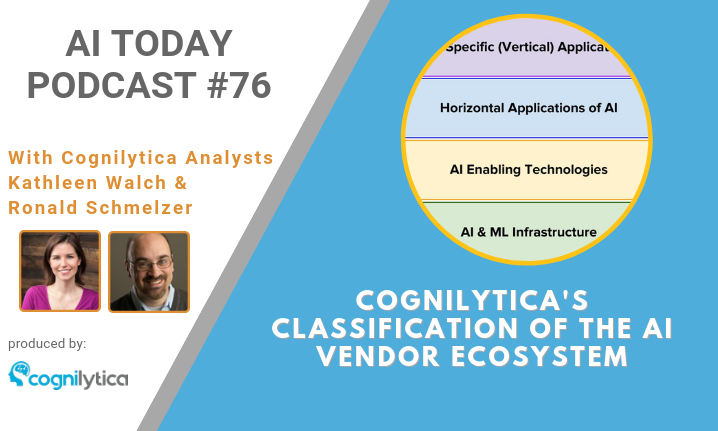 In this podcast, we go over our classification system and how it helps to make sense of the growing AI vendor landscape. Digital self defense: Is privacy tech killing AI?